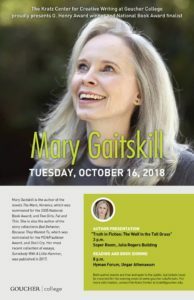 The Kratz Center for Creative Writing at Goucher College will welcome our Fall 2018 Visiting Author Mary Gaitskill who will give a presentation and a reading on Tuesday, October 16 2018. Click on the picture for more information. Mary Gaitskill is the author of the novels The Mare, which was nominated for the 2005 National Book Award; and Two Girls, Fat and Thin. She is also the author of the short story collections Bad Behavior; Because They Wanted To, which was nominated for the PEN/Faulkner Award, and Don’t Cry. Her most recent collection of essays, Somebody With A Little Hammer, was published in 2017. 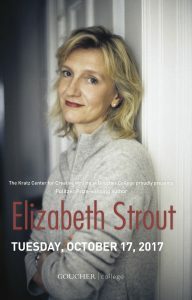 The Kratz Center for Creative Writing at Goucher College proudly presented Pulitzer Prize winner Elizabeth Strout for two events on October 17, 2017. In the afternoon, the author gave a presentation called, “Why You Don’t Need To Worry About Plot” in the Soper Room of the Julia Rogers Building at 3:00pm. In the evening, Ms. Strout read from and signed copies of her brand new novel, Anything Is Possible, which was written in tandem with her bestseller My Name is Lucy Barton. Anything is Possible draws on the lives of the small-town characters evoked in the discussion between Lucy and her mother. Born in Portland, Maine, Strout graduated from Bates College with a degree in English in 1977. She received a law degree along with a Certificate in Gerontology from Syracuse University College of Law. Strout has taught creative writing at Manhattan College, The New School, Bard College, Colgate University, and Queens University of Charlotte. She divides her time between Maine and New York City. Each year during the Fall semester, the Kratz Center for Creative Writing welcomes a distinguished Visiting Author to Goucher College who is nationally or internationally renowned for their writing. The author reads from her or his work, signs books, conducts master classes, or chats with students and community members. Jennifer Weiner joined us on Wednesday October 8, 2014 to discuss her work and sign books in the Hyman Forum of the Sanford J. Ungar Athenaeum. That day, she also met with students and community members in the Soper Room of the Julia Rogers Building. Lynda Barry joined us on Wednesday September 25, 2013 for a reading, discussion and book signing at 8 PM in Goucher’s Hyman Forum. Lynda Barry also offered two master classes on Monday and Tuesday September 23 and 24, 2013 from 4-6 PM in Goucher’s Batza Room. For more information, click here. Colm Tóibín joined us on Monday, November 12, 2012 at 8 p.m. for a reading and book signing at the Kraushaar Auditorium. That day he also met with students and community members for a small, informal chat at 3:30 p.m. in the Siebert Curriculum Resource Center of the Library within Goucher’s Athenaeum. Sherman Alexie—the award-winning Native American author, poet, and filmmaker—gave a presentation, answered questions, and signed copies of his books on Wednesday, September 21, at 8 p.m. in Goucher College’s Kraushaar Auditorium. He also participated in an informal meet-and-greet at 3:30 p.m. with students on the day of his visit in the Siebert Curriculum Resource Center of Goucher’s Library in the Athenaeum. Ann Patchett was the Kratz Center’s Fall 2010 Visiting Author. She read from her work on Wednesday September 29, 2010 at 8 PM in the Kraushaar Auditorium and held a conversation with students on the prior day from 3-5:30 PM with the community in the Soper Room. Carolyn Chute was the Kratz Center’s Fall 2009 Visiting Author. She read from her work at the Hyman Forum at the newly opened Athenaeum at 8 PM and held a conversation with the community in the Siebert Curriculum Resource Center in the Goucher College Library on Thursday October 22, 2009 at 8 PM. Louise Erdrich was the Kratz Center’s Fall 2008 Visiting Author. She read from her work at 8 PM on Tuesday October 28, 2008 in the Kraushaar Auditorium and met with students from 3:30-5 PM in the Soper Room of the Julia Rogers Library. Edward P. Jones was the Kratz Center’s fall 2007 visiting author. He read from his work at 8 PM on Monday October 15, 2007 in the Kraushaar Auditorium. Goucher’s Office of Multicultural Affairs and the Kratz Center co-sponsored a conversation with Mr. Jones on the same day from 3:30-5 PM in the Soper Room of the Julia Rogers Library. Marjane Satrapi was the Kratz Center’s Fall 2006 Visiting Author. She read from her work on Wednesday November 1, 2006 at 8 PM in Kraushaar Auditorium and, on the day prior, held a master class with creative writing and visual art students in the Soper Room. W. S. Merwin was the Kratz Center’s Fall 2005 Visiting Author. He read from his work on Tuesday October 11, 2005 at Kraushaar Auditorium and met with students in the Soper Room from 3-5 PM on the day prior to his reading. Robert Stone was the Kratz Center’s Fall 2004 Visiting Author. He read from his work at 8:00 PM on Monday October 11, 2004 at the Kraushaar Auditorium and met with students on the same day from 3-5 PM in the Soper Room. Julia Alvarez and Edwidge Danticat were the Kratz Center’s Fall 2003 Visiting Authors. They read from their work at Goucher’s Kraushaar Auditorium on Wednesday October 23, 2003 and held a conversation with the community from 3-5 PM on the same day. Seamus Heaney was the Kratz Center’s Fall 2002 Visiting Author. He read from his poetry at 8 PM on Thursday, October 24, 2002 in Kraushaar Auditorium. Reynolds Price was the Kratz Center’s Fall 2000 Visiting Author. 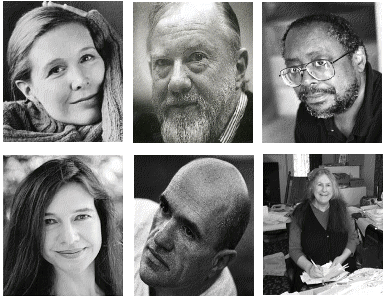 He read from his work on Wednesday, October 25, 2000 at 8 PM in Kraushaar Auditorium. David Guterson was the Kratz Center’s inaugural Fall Visiting Author. He read from his work on Monday, September 13, 1999 at 7:30 PM at the Kraushaar Auditorium.